Over the next few weeks, a handful of Incluseumers will reflect on and unify three topics that are usually treated as separate. At the end of each post, we’ll attach a worksheet with suggestions for how to work through some of the ideas we discuss. You can download and print these worksheets to initiate conversations with colleagues. 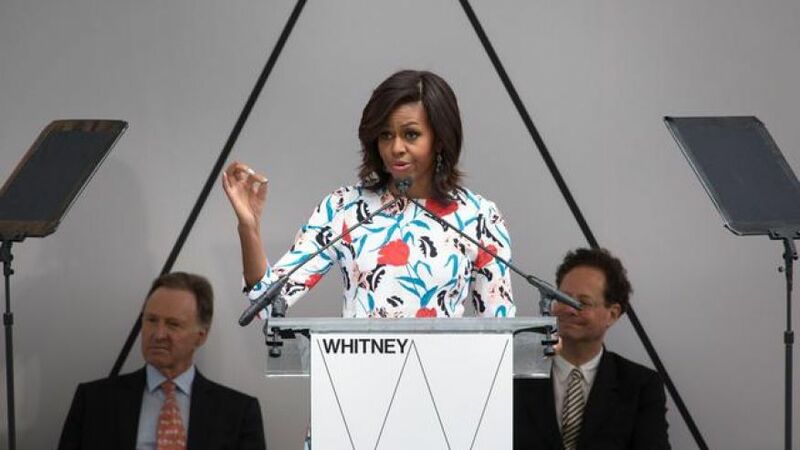 For the first post in this series, Porchia, Aletheia, and I (Rose) respond to Michelle Obama’s speech for the reopening of the Whitney. You see, there are so many kids in this country who look at places like museums and concert halls and other cultural centers and they think to themselves, well, that’s not a place for me, for someone who looks like me, for someone who comes from my neighborhood. In fact, I guarantee you that right now, there are kids living less than a mile from here who would never in a million years dream that they would be welcome in this museum. And growing up on the South Side of Chicago, I was one of those kids myself. The First Lady is right, we see the issues she calls out and know museums need to deal with them. Just last month, the Incluseum featured the research of Emily Dawson who pointed out the myriad of ways in which museums act as exclusive spaces for people from ethnic minority groups. Cecilia Garibay is another research who’s been invested in better understanding the barriers Latino families face to museum visitation and participation. And in 1993, Marilyn Hood conducted research to shed light on the barriers African-Americans experienced to museum visitation. These barriers and the ways in which exclusion is enacted and perpetuated in museums, however, tend to be invisible to people of the dominant culture. Why would they notice after all since these institutions affirm their values, aesthetic, modes of communication…in short their cultural capital. As we already discussed in this blogpost, this status quo isn’t any one individual’s fault, but represents the ways in which exclusion and oppression are systemic. As Charles M. Blow reminds us in his NY Times Op-Ed., it’s our collective responsibility, but especially the responsibility of those who benefit the most from these structures to demolish them. We would also like to assert that when a group of individuals collectively, historically, and doggedly point out that they feel excluded, unheard, or othered, a culturally responsive and responsible reaction is to not further invalidate this groups’ lived experiences by declaring that they are wrong, hypersensitive, or that they need to change their behavior. If museums are truly for everyone and we repeatedly hear from various groups that they do not feel that they are counted amidst that number; then as institutions dedicated to the preservation and promotion of cultural heritage for all–we must address this perceived exclusion. To be clear, when we speak about cultural equity and inclusion, we are not suggesting that museums can singlehandedly solve issues related to race relations in this country. But we are asking museums to work on “race issues” on an institutional level. How can we promote culture, preserve and display cultural heritage objects and then ignore the fact that our very buildings are places in which all visitors do not feel that there is reciprocity and welcome in the work that we do? Relatedly, those who complain that the First Lady’s comments worsen race relations are most likely those for whom the reality of these race relations tend to not be as visible since they are not materially or symbolically disadvantaged by them. Many people in this country have been taught that, by not talking about race, problems pertaining to racism would just disappear. Or, in fact, that race and racism are subjects which should not be discussed because many racial divides have been conquered and the practice of enslavement and segregation are moments in America’s history which have long passed. In this sense, it would be easy to contend that our racial past has no contemporary bearing. But this, of course, is not our immediate reality despite claims that the election of Barack Obama ushered in a post-racial, colorblind era. In fact, we believe that things can only get better through (1) exposing how factors such as race permeate and structure our institutions, (2) acquiring cultural competence skills (which requires meaningful dialogue on issues such as race), (3) healing collectively and individually from past trauma (e.g., slavery and segregation), and (4) enacting alternative institutional behaviors and practices grounded in anti-oppression analyses. This will require that we truly work together. We will explore some of these ideas in more depth in the next blogpost on #museumsrespondtoferguson and activism (i.e., a response to this Center for the Future of Museums blogpost). Yes, all museums must address the “race issue” because, as the First Lady pointed out, the notion that museums are public white spaces promoting white culture still exists. Whether an institution wants to recognize this reality or not, this perception will continue to function as a barrier to participation for millions of people. In failing to both internally and externally examine the myriad of ways in which our practices continue to uphold this notion in both perception and practice, we continue to maintain a barrier that feels culturally isolating and invalidating. Actually, if black and brown folks feel uncomfortable in “our” museums, that’s very much “our” problem! Museums are public institutions and we would like to see museum practitioners be deeply invested in ensuring all are welcome and able to meaningfully participate in these organizations. Museums invest wisely in many aspects pertaining to the growth and longevity of our institutions. For example, in great architecture and facilities (e.g., the new Whitney), in expensive digital initiatives and in blockbuster exhibits. But what are our human investments? In what ways can we invest more directly in the people and communities we serve or want to serve and in the relationships that we need to cultivate? What is the future of museums if only a fraction of the potential visitors come? Finally, as museum practitioners and scholars, we want to say to the news outlets and individuals who slammed the First Lady’s speech with racist and bigoted commentary: We don’t need you defending us (museums) on this! Thank you. I am looking forward to using the worksheet. A good read, and I look forward to the rest of the series. I’m particularly interested in the phrase “human investments,” and the way it resonates with other discussions going on in the field about inclusion, paid/unpaid internships, wage equality, and diversity of all sorts in leadership roles.